Have you heard? There's a big event going on at CASology! We're coming up to our 100th Cue Card and we're dying to mark this happy occasion with you! And there's PRIZES! 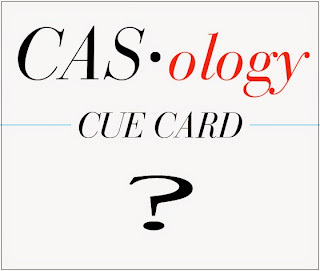 The first way to win is to go to CASology and leave a comment with your guess as to what our 100th Cue Card will be. If you win, you will be our Guest Designer for the month of July! The big reveal will be at our normal challenge time, Tuesday at 9 am EDT. Also, each day, at 11 am EDT, one of the DT members will be featured at CASology (today is Melissa). Once you've had a chance to get to know each designer better, head over to their personal blogs within 24 hours to leave a comment for a chance at some blog candy! That's 10 (count 'em!) chances to win! There's more information at CASology - go check it out!